Washington DC: mobile broadcast live studio from StudiGo. Hackensack, NJ, October 2016: LiveU has helped power StudiGo, an innovative mobile interview facility that brings the broadcast studio to guest commentators, allowing for easy and immediate studio access. When breaking news happens, news organizations have to send out crews and obtain guest experts to comment quickly. StudiGo can travel to an expert’s location and within minutes go live on air, delivering seamless broadcast-quality transmission of the vehicle’s camera signal to the news organization. “On-air experts are highly sought-after and as a result have busy schedules that don’t always accommodate going into the studio for an interview. This can be a challenge for guest bookers and segment producers that need to figure out who to bring in, how to get them in (particularly late in the evening, in the middle of the night, or on weekends), and alternatives to an in-studio (Skype Video, Audio call) if they can’t come in,” said Adiel Kiviti, StudiGo Founder & CEO. 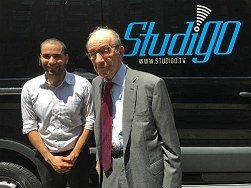 Broadcasters have utilized StudiGo to secure live interviews with former Chairman of the Federal Reserve Alan Greenspan, former Reagan Advisor Pat Buchanan, former Romney Chief Strategist Stuart Stevens, former FDIC Chair Sheila Bair, AOL co-founder Steve Case, former US Undersecretary of State Richard Armitage, SVP of the US Chamber of Commerce Bruce Josten, and others. Enabled by LiveU’s LU700 hybrid video uplink system and Xtender transmission device, news channels can now enjoy live studio content from the curbside comforts of their guest’s home, office, business dinner or meeting – wherever, whenever. StudiGo is currently available 24//7 in the greater Washington, DC area (DC, Maryland, and Northern Virginia). The company plans to roll out services in New York and Los Angeles. The mobile interview facility is also available for news organizations to purchase to supplement their productions.